Garage door problems are arduous enough all on their own. Not only does this mean that the security of your home, as well as your possessions, are compromised, it also means that you can’t leave the house until the matter is settled. And while you’re stewing on the stress of dealing with your broken garage door, another issue crops up. That is, where can you find a reliable garage door repair near you? Well, all these issues can be promptly dealt with if you just give Viking Overhead a call. For prompt, professional, and affordable garage door services, you can count on Viking Overhead to deliver and go beyond your expectations. Give us a call at 817-600-4224 to request our service or send us a quick message online. If you live in Dallas, Fort Worth or any of the surrounding areas, there should only be one name for your garage door needs. Whether you’re dealing with a stuck garage door or a garage door that refuses to open, you can trust Viking Overhead to have successfully dealt with that kind of problem before. As a family-run business owned by a US army veteran, our company adheres to strict quality standards in all our projects no matter how big or small. We’ve also perfected the correct brew for providing unbeatable services and customer care with remarkable results. 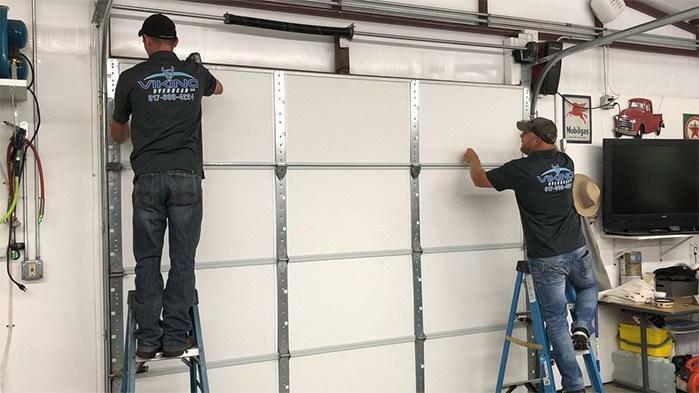 Each member of our team is a licensed and certified technician, who are extensively experienced in providing all sorts of garage-door related services. In instances where repairing does not cut it, don’t fret. Our team of technicians can perform a complete garage door replacement service for your old and damaged one. Our installation service for new doors and openers is clean, efficient, and professionally done. Aside from that, we can install safety sensors and reinforce your garage door for added security and for your peace of mind. Since we’re all about providing unmatched services to our clients, we’ve made them available 24/7 at the most competitive price. No matter what time of the day, count on Viking Overhead to be there. Whether you’re in need of a garage door repair, installation, or just a simple maintenance and inspection, don’t hesitate to give our team a call. Viking Overhead offers anything and everything you need, to keep your garage doors running on top condition. We offer same day service so you need not worry about missing important appointments. For a service you can trust to exceed all your expectations, Viking Overhead is the only one you need.